Thomson Reuters (NYSE:TRI) has reported its FX trading volumes for the month ending February 2016, which took a tumble MoM after what had been a strong start to the New Year at the venue, according to a Thomson Reuters statement. 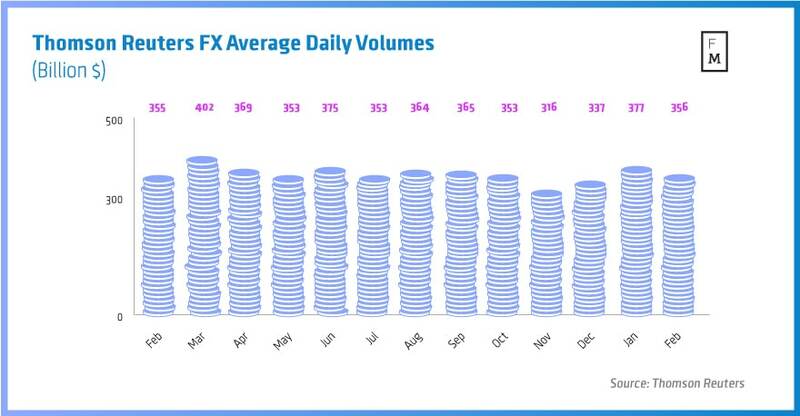 In particular, Thomson Reuters saw a total average daily volume (ADV) of its foreign exchange (FX) products, including spot, forwards, swaps options and non-deliverable forwards (NDF), come in at $356 billion, which represents a fall of -5.6% MoM from $377 billion in January 2016. This was virtually unchanged compared to 2015, marking a rise of less than 1.0% YoY from $355 billion in February 2015. Of the $356 billion however, $111 billion was FX spot volume compared to $245 billion for other products. Despite the monthly spot FX volume being lower MoM at Thomson Reuters, February 2016 also represented a step backwards over a yearly measure as well. The latest volumes reflect a -2.6% decline from $114 billion in FX spot volume in February 2015. While February 2016 did not set any records in terms of volumes, the monthly performance was still strong, especially when weighed against other institutional exchange venues that saw a wide decline in trading volumes during the previous month. In addition, the latest figures also appear to hold onto the majority of momentum seen in at Thomson Reuters in Q1 2016, which by and large has erased a lackluster Q4 2015 in which volumes were trending downward.